When inspecting apricots there are a few defects you should always keep an eye out for. Bruising, surface discoloration, soft and decay are the most common defects, along with sunken discolored areas. 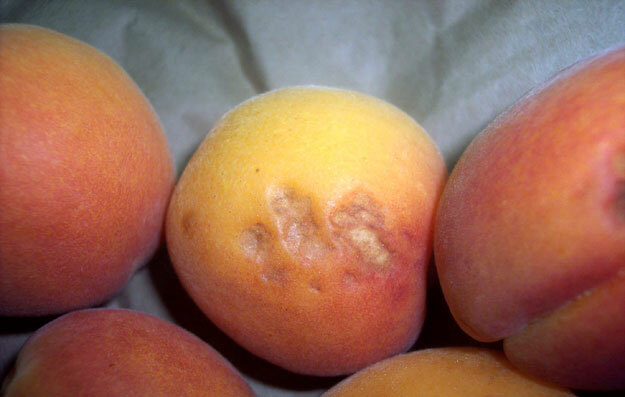 The USDA has not issued any scoring guidelines for sunken discolored areas affecting apricots. They leave it up to the judegement of their inspectors to determine if the defect is a scorable. Because the defect closely resembles bruising, it would be safe to use the brusing scoring guideline. Score the apricot as being damage (a defect) if the sunken discolored area exceeds an area of 3/8 inch, or exceeds 1/8 inch in depth. Score the sunken discolored as serious damage if the area exceeds 5/8 inch or exceeds 3/16 inch in depth. Looking at the image above the apricot would be scored as serious damage based upon this scoring guideline.